Set on the lush and unspoilt East Coast of Bali, Hotel Komune Resort and Beach Club is blessed with a hypnotising view of the world famous Keramas surf break. Fronted by a pristine volcanic beach, this beachfront Bali resort offers a wonderful experience of spending leisure time in a natural luxury hotel. It features 66 impressive 4 star rooms and suites and 5 star beach front pool suites as well as 1, 2 and 3 bedroom villas. Sumptuously appointed beachfront accommodation with artistic furniture, this unique Bali resort articulates the identity of the Island of the Gods. The Beach Club was also voted in the top 5 in Asia and their executive chef brings his worldwide cuisine experience to their dishes. Inviting entertainment and exquisite nibbles from Asia, Europe, and Australia are being served in themed night dinners. Thanks to the awesome ocean vista they feature a selection of idyllic Bali wedding venues: Bali beach lawn wedding, and a traditional beachfront warung wedding. A new Health Hub is perfect for those who are looking for an active escape, with state of the art facilities designed to let guests maintain their healthy and active lifestyle while on holiday. Come on a yoga or fitness retreat and immerse yourself in the Island of the Gods. Corporate meeting rooms with artistic Balinese touch are other opulences of this 5 star resort. The all inclusive incentives package is designed for for all types of guests but most importantly make it the perfect choice to base your next Bali surf trip from. Hotel Komune Bali is a family friendly resort with all the luxury inclusions, and is definitely worth visiting on every Bali itinerary! And Hotel Komune Bali is easy to get to as it sits only 40 minutes away from Ngurah Rai International Airport. This stylish resort accommodation by the beach provides you with the perfect base for your Bali holiday experience, whether you’re there for the sun, the surf, exploring the area or even enjoying a yoga retreat at their health hub, the choice is yours at Hotel Komune Bali. Komune @ Keramas is a 25 minute drive from Sanur and 40 minutes from the airport provided the toll road route is taken. Please ensure you request your driver takes you the toll road route from the airport. 1. Continue past Sanur along the Ngurah Rai Bypass approximately 10 minutes. 2. Turn right onto the Prof. Dr. Ida Bagus Mantra Bypass and continue along the new 4 lane highway for approximately 15 minutes. 3. When you arrive at the traffic lights for the right turn to Pura Masceti (before the Bali Safari & Marine Park) do a U-turn. Continue for approximately 1100m until you find the left turn to Pantai Keramas (Keramas beach) car park. 4. Komune is located on the left turn halfway to the beach car park at Keramas. Hotel Komune Beach Club at the famous Keramas surf beach is designed as your all day place to hang, re-charge and party. Kick back & listen to tunes, scope the net, check the waves and mix good times with good people. After a short walk through Komune’s organic gardens on a sandy beach path lined with an array of tropical fruits, guests stare in amazement at their first glimpse of the majestic Keramas surf break which makes the stunning backdrop for Hotel Komune’s Beach Club. The 180 metres of private lawns and gardens provide the perfect backdrop for spectacular photo opportunities. Visitors to Hotel Komune can laze away the day in the sun enjoying the cool tunes and service from our fun & friendly Balinese staff. For the more active, head out to tackle the four surf breaks right out the front or take a stand up paddle board out for a ride. When the tide pulls low the rock pools and crystal clear lagoon are perfect for swimming and snorkelling. Once you’ve worked up an appetite, there’s plenty of great food choices on offer including an array of healthy juices, colourful cocktails, delicious seafood, authentic pizzas, and fresh salads. Simple, tasty and fresh is the mantra here. Evening sets the scene for a different dining experience set under the starlight with your feet in the sand. Hotel Komune’s Beach Club provides an experience like no other in Bali. All who visit this piece of paradise are in awe of its beauty. They leave relaxed, sun kissed and dreaming of when they’ll next return. With free Wi-Fi, satellite TV and comfortable beds in a beachside resort, you can choose from private beach villas, luxurious beachfront pool suites, convenient resort rooms and even spacious family suites. Hotel Komune’s luxurious beachside villas offer a range of resort holiday accomodation for those seeking a little privacy and luxury on their Bali vacation. The suite rooms at Komune beach resort at Keramas are designed for families and couples seeking more space and extra luxury during their stay in Bali. Each room features a luxury queen size bed, seperate living area with fold out sofa bed – perfect for a small child, a private ensuite with shower, mini bar, FREE high speed Wi-Fi internet, satelite TV, couch and study desk, in-room safe, ceiling fan and of course air-conditioning to take the edge off. Inter-connecting rooms are also avaliable upon request. The suite rooms offer additional luxuries such as pillow menu, evening turn down service, a retracting TV console and outdoor setting. Komune’s suite room guests have all day access to the Beach Club and all of the facilities it offers with a choice of dining options and Free Wi-Fi connection. 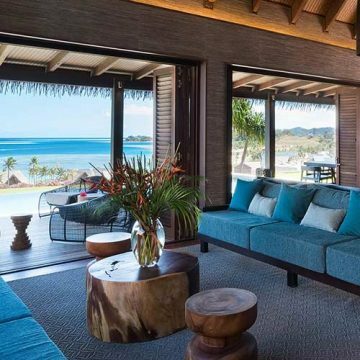 Hotel Komune have extended the yoga facilities after the success of their beachfront yoga pavilion which has been booked out for the past six months. The new pavilions and facilities have been designed to allow yoga groups and classes to host their own retreats in Bali using their facilities. Groups can take advantage of our Bali beachfront accommodation and Komune will provide a spectacular canvas from which you can create your own unique retreats. A 25 metre training pool – this pool was installed to facilitate aerobic training for surfers, as well as breathing training and big wave training. It’s also a general training and fitness pool for Hotel Komune guests. Hotel Komune have recently upgraded their organic farm with the help of Mara Wolford, an organic agriculture expert. They strive to be self sufficient in fruits such as bananas, pineapples and papaya, general herbs, chillis, beetroot and garden greens such as beans, zucchinis and broad leafs for salads. They have their own chickens for egss and goats for milk, fed only organic produce. They’ve also created a dedicated healthy cafe and restaurant where we serve healthy, organic foods and cold pressed juices to their group training guests during their stay. Hotel Komune have installed a world class functional training centre again to facilitate fitness groups such as Cross Fit and F45 to host their own retreats in Bali with their members or customers. Their equipment includes a range of free weights, TRX, barbells, kettlebells, medicine balls, swiss balls, heavy ropes, parallel bars, chin-up bars, rings, box, boxing, bosu balls, surf set boards, rowing machines and much more. Hotel Komune recognises not all guests will want to train in groups. As such, they’ve provided a first class gym with all the equipment one would expect to see at a top-end fitness centre in Australia. A full range of cardio equipment, pin and weights will allow guests to train at their leisure and own pace. To relax the muscles after a hard day training and surfing they have included an 8 room day spa with wet and dry treatment rooms plus a beauty and hair salon. A full range of hair services – cut, style, blow dry, colour. Komune Bali offers a world first permanent night surfing installation right in front of the resort. You can enjoy the amazing spectacle of surfers battling the waves at night, or even book a night surf for yourself under powerful floodlights. Bookings ensure there are only 6 surfers sharing the waves each night, so you can enjoy the powerful right hand reef breaks off Keramas reef without the crowds. A world class break, Keramas provides some fantastic waves with deep tube rides just 50 metres offshore. The Night surf shows are on every night from 7pm to midnight, as well as 4am to 6am for those who like a truly early morning surf. Many nights we feature a night surfing display put on by one of the local Bali Boardriders clubs, which include some of the world’s best surfers. After your days’ activities you can catch the show from the Komune Bali Beach Club, or watch from the comfort of your room as all the luxury beachside villas provide sweeping ocean views along with the spectacle of the night surfers. Spend 7 fun filled days eating, playing and surfing with this accommodation package. Daily cafe style breakfast consist of any one main item each of Breakfast menu, a fresh juice, an espresso coffee or pot of tea, Toast station with fresh homemade breads and jams selections. Children under the age of 12 years accompanied by a paying adult can eat breakfast for free off the Children’s breakfast menu. Spend 5 fun filled days eating, playing and surfing with this accommodation package. Keramas is a powerful right hand wave that breaks directly in front of the Hotel Komune Bali. It is known as one of the most high performance waves in the world but it is better known as a world class barrel that breaks over a reef and rock bottom along Bali’s East Coast. It prefers a light northwest or westerly wind and is best during the early morning hours before the traditional easterly trade winds can kick in. It can get crowded at times but staying at the resort gives guests the luxury to be on it when the conditions and crowds line-up. All in all a super fun wave surrounded by a number of other great waves around it; a solid spot to base any Bali surf trip at due to ease of access to go surfing and the view of the wave from the resort in truly one-of-a-kind!